EJF Singled Out on Leanblog.org as "Making a Difference For Patient Safety"
We at the Emily Jerry Foundation are proud to announce a mention of our mission/organization by Mark Graban of Leanblog.org in a recent article titled “Some People Who Are Making a Difference for Patient Safety”. Leanblog is run by Mark and focuses on being “Lean in hospitals, business, and our world.” Being “Lean” refers to “The Toyota Way” management system, which has two parts: 1.) Eliminate waste and non-value-added activity (NVA) through continuous improvement, 2.) Practice respect for people. The article highlights three deserving foundations that are making an impact by trying to turn tragedy into triumph. The Louise H. Batz Patient Safety Foundation and The Josie King Foundation join the Emily Jerry Foundation on this list of patient safety advocates that are working to eliminate preventable medical errors. We are thankful for people like Mark who are attempting to shed light on organizations such as ours. I am also excited to have been asked to join Mark as a guest on one of his upcoming podcasts! Pharmacy Purchasing & Products magazine is the health-system pharmacist’s premier source for practical and actionable information on the products and services that impact their practice. 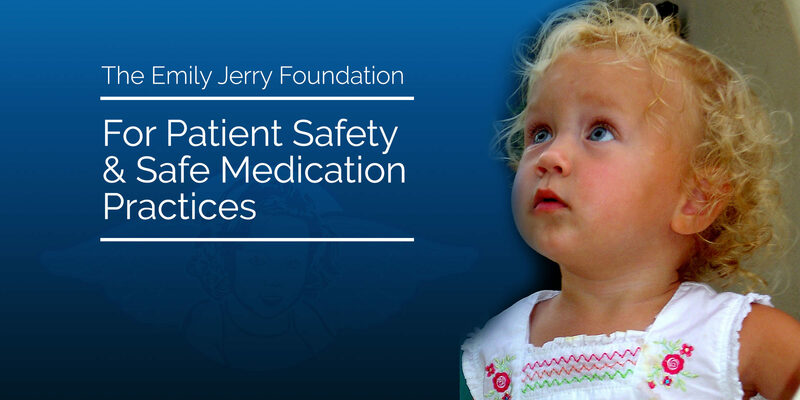 That is why I was very excited to be asked for the opportunity to do a Q&A interview session regarding details on the Emily Jerry Foundation and especially highlighting our advocacy efforts for safe pediatric medication labeling. Click here to read the full article titled: “Advocating for Safe Pediatric Medication Labeling” which appears in the March 2014 edition.